Dream Jackpot is a new kid on the block when it comes to online casinos. A few years ago, that would’ve been enough to ensure a certain level of interest from players, but with the sheer number of new sites that appear on a seemingly daily basis in the modern market, it takes a lot more than that these days. In fact, where being new once worked to an online casinos advantage, the opposite is now true. There are so many sites that have been established for many years, that a new pretender to the throne will often struggle. Dream Jackpot is playing the part of the young lion that’s challenging the leader of the pride, and it needs to make sure its claws are sharp! 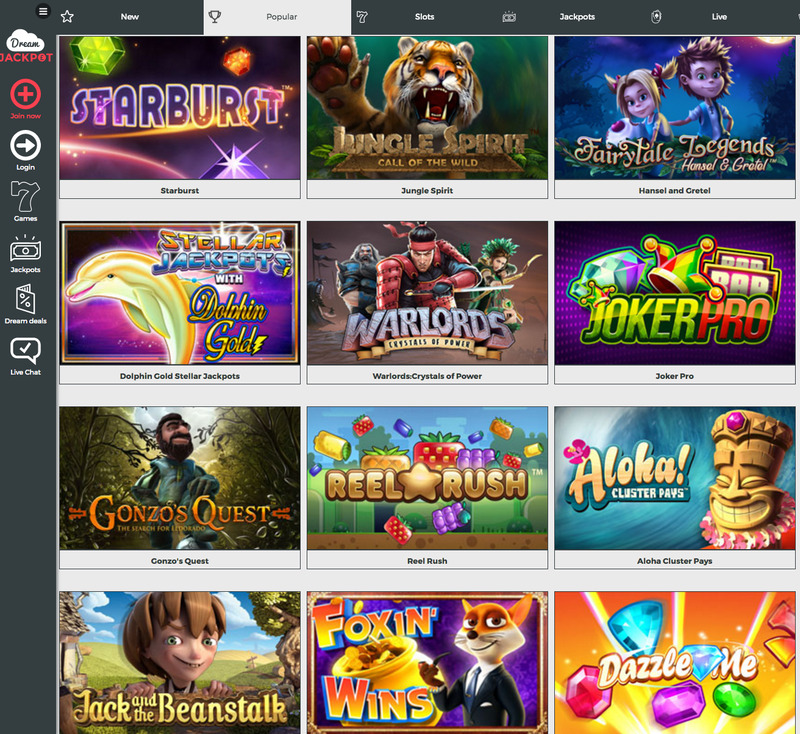 After the promotions have caught the eye of prospective players, Dream Jackpot then has to keep them, and it is within a strong selection of games and an enticing look that most sites accomplish this, so does Dream Jackpot have what it takes? Dream Jackpot is a site that has come in with a very specific theme and a very clear ambition, to appeal to those who have dreams of being a high roller, those who want to see their name in one of those news articles we all know so well, announcing that a lucky player somewhere has won themselves millions with one spin on a progressive jackpot slot. This theme comes with some expected design touches, but that isn’t what you get here. Unfortunately, not being predictable is about the only compliment that can be given to the design work at Dream Jackpot. Styled like an old arcade, and not the kind that we all have fond memories of, the images are dated, as is the colour scheme, the whole site looks like it would’ve felt old fashioned twenty odd years ago, and that simply isn’t going to cut in when you are trying to get noticed in one of the most competitive industries in the world. Navigation is simple enough, which is nice, but not even close to sufficient when you consider the other online casinos that exist. There are brilliantly designed online casinos wherever you look, and this total visual disappointment just can’t hold a candle to them. Those who are fans of sports betting will be aware of the term “a game of two halves”, and when looking at the quality of Dream Jackpot as an online casino, that description could not be any more perfect. As bad as the design here, if anything is going to make up for it, it’s the games selection here. 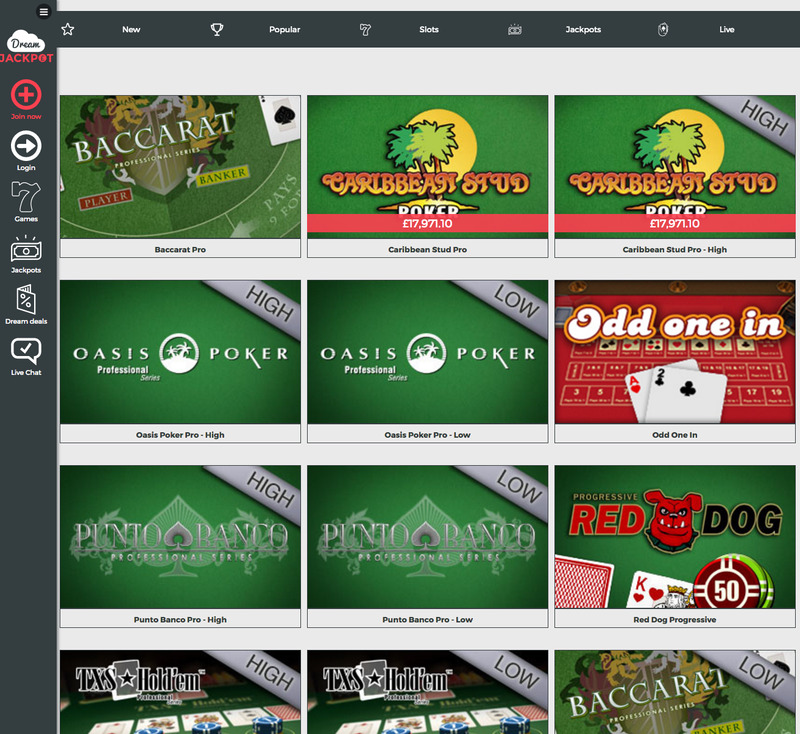 A site that has just been released rarely has a collection of games that can stand up to its competitors in terms of variety, but with titles from 1X2 Network, Aristocrat Gaming, Blueprint Gaming, edict egaming, ELK Studios, Evolution, Ezugi, Leander Games, Microgaming, NetEnt, Novomatic, NYX Gaming, Quickspin, Stars Group, Thunderkick, and White Hat Gaming all on offer, Dream Jackpot certainly does! New and old titles, including video slots, classic slots, and obviously a host of jackpot slots, alongside table and card games, an impressive live casino, and a collection of scratchcards means that whatever your preferences are, you are bound to find something to suit your taste at Dream Jackpot. Barbados Casino is a site that is in need of a complete redesign, but if it gets that, it could be one of the best new online casinos of the year!